This article is about 20th-century earthquakes. For earthquakes before 1901, see Historical earthquakes. For earthquakes after 2000, see List of 21st-century earthquakes. ^ "Magnitude 8 and Greater Earthquakes Since 1900". Archived from the original on April 14, 2016. Retrieved April 13, 2016. ^ "general articles3.pdf - jul102000 - currsci - Indian Academy of Sciences" (PDF). Retrieved April 13, 2016. ^ a b Schlupp, Antoine; Cisternas, Armando (2007). "Source history of the 1905 great Mongolian earthquakes (Tsetserleg, Bolnay)". Geophysical Journal International. 169 (3): 1115–1131. Bibcode:2007GeoJI.169.1115S. doi:10.1111/j.1365-246X.2007.03323.x. ^ Cucci, Luigi; Tertulliani, Andrea (2008). "Characterization of the seismogenic source of the great 1905 Calabria (southern Italy) earthquake from environmental effects". Retrieved September 4, 2009. ^ Okal, E.A. (2005). "A re-evaluation of the great Aleutian and Chilean earthquakes of 1906 August 17" (PDF). Geophysical Journal International. Royal Astronomical Society. 161 (2): 268–282. Bibcode:2005GeoJI.161..268O. doi:10.1111/j.1365-246X.2005.02582.x. Retrieved February 19, 2012. ^ Martin S.S.; Li L.; Okal E.A. ; Morin J.; Tetteroo A.E.G. ; Switzer A.D.; Sieh K.E. (March 26, 2019). "Reassessment of the 1907 Sumatra "Tsunami Earthquake" Based on Macroseismic, Seismological, and Tsunami Observations, and Modeling". Pure and Applied Geophysics. doi:10.1007/s00024-019-02134-2. ISSN 1420-9136. ^ Baroux, E.; Pino, N. A.; Valensise, G.; Scotti, O.; Cushing, M. (2002). "Source Mechanism Of The 11 June 1909, Lambesc (southern France) Earthquake From". Egs General Assembly Conference Abstracts: 4825. Bibcode:2002EGSGA..27.4825B. ^ NGDC. "Comments for the Significant Earthquake". Retrieved December 30, 2010. ^ NGDC. "Comments for the Significant Earthquake". Retrieved June 9, 2011. ^ NGDC. "Comments for the Significant Earthquake". Retrieved December 28, 2010. ^ National Geophysical Data Center. "Significant Earthquake". Retrieved November 10, 2012. ^ "Historic Events - Earthquakes". Geoscience Australia. Retrieved June 27, 2015. ^ "Noteworthy earthquakes in Australia". University of Queensland. Retrieved June 27, 2015. ^ "Comments for the 1918 Celebes Sea Earthquake". Significant Earthquake Database. National Geophysical Data Center. Retrieved June 27, 2015. ^ Guidoboni, Emanuela; Ferrari G.; Mariotti D.; Comastri A.; Tarabusi G.; Valensise G. (2007). "CFTI4Med, Catalogue of Strong Earthquakes in Italy (461 B.C.-1997) and Mediterranean Area (760 B.C.-1500)". INGV-SGA. Retrieved July 22, 2011. ^ National Geophysical Data Center. "Comments for the Significant Earthquake". Retrieved July 31, 2012. ^ GeoNet. "M 7.8, Buller (Murchison), June 17, 1929". Archived from the original on June 4, 2010. ^ Pino, N.A. ; Palombo B.; Ventura G.; Perniola B.; Ferrari G. (2008). "Waveform modeling of historical seismograms of the 1930 Irpinia earthquake provides insight on "blind" faulting in Southern Apennines (Italy)". Journal of Geophysical Research. 113 (B05303): B05303. Bibcode:2008JGRB..11305303P. doi:10.1029/2007JB005211. Retrieved July 6, 2010. ^ "Magnitude 8 and Greater Earthquakes Since 1900". Archived from the original on November 12, 2009. Retrieved April 13, 2016. ^ a b USGS. "Earthquakes with 1,000 or More Deaths since 1900". Archived from the original on January 14, 2013. ^ National Geophysical Data Center. "Significant earthquake details". Retrieved December 22, 2011. ^ National Geophysical Data Center. "Significant earthquakes details". Retrieved December 22, 2011. ^ Singh, S.K. ; Pacheco J.F. ; Alcántara L.; Reyes G.; Ordaz M.; Iglesias A.; Alcocer S.M. ; Gutierrez C.; Valdés C.; Kostoglodov V.; Reyes C.; Mikumo T.; Quaas R.; Anderson J.G. (2003). "A Preliminary Report on the Tecomán, Mexico Earthquake of 22 January 2003 (Mw 7.4) and Its Effects". Seismological Research Letters. Seismological Society of America. 74 (3): 279–289. doi:10.1785/gssrl.74.3.279. Retrieved December 22, 2011. ^ Pavlides, S.B. ; Tranos M.D. (1991). "Structural characteristics of two strong earthquakes in the North Aegean: Ierissos (1932) and Agios Efstratios (1968)" (PDF). Journal of Structural Geology. 13 (2): 205–214. Bibcode:1991JSG....13..205P. doi:10.1016/0191-8141(91)90067-s. Retrieved August 1, 2010. ^ Rivera, L.; Sieh K.; Helmberger D.; Natawidjaja D. (2002). "A Comparative Study of the Sumatran Subduction-Zone Earthquakes of 1935 and 1984" (PDF). Bulletin of the Seismological Society of America. 92 (5): 1721–1736. Bibcode:2002BuSSA..92.1721R. doi:10.1785/0120010106. Retrieved November 25, 2010. ^ "Magnitudes and Moments of Earthquakes" by K. Abe in "Global Earth Physics: A Handbook of Physical Constants" edited by T. J. Ahrens. ^ "1739.pdf - dec252008 - currsci - Indian Academy of Sciences" (PDF). Retrieved April 13, 2016. ^ Paula Dunbar. "Significant Earthquakes Database". Retrieved April 13, 2016. ^ Evans, S.G.; Roberts N.J.; Ischuck A.; Delaney K.B. ; Morozova G.S. ; Tutubalina O. (November 20, 2009). "Landslides triggered by the 1949 Khait earthquake, Tajikistan, and associated loss of life". Engineering Geology. 109 (3–4): 195–212. doi:10.1016/j.enggeo.2009.08.007. Retrieved July 10, 2010. ^ Papazachos, B.C. 1996. Large seismic faults in the Hellenic Arc. Annali di Geofisica, 39, 891–903. ^ E. Chael and G. Stewart, "Recent large earthquakes along the Middle America trench and their implications for the subduction process"
^ "Historic Earthquakes". Retrieved April 13, 2016. ^ NGDC. "Comments for the 1969 Earthquake". Retrieved June 27, 2011. ^ "国家地震科学数据共享中心". Retrieved April 13, 2016. ^ a b Kristof, Nicholas D. (November 19, 1988). "Chinese Disclose That Quake In 1970 Killed About 10,000". The New York Times. Retrieved November 8, 2008. ^ "China breaks silence on devastation from quake 30 years ago". Saint Louis Post-Dispatch. January 8, 2000. Retrieved November 6, 2008. 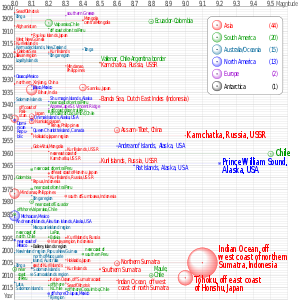 ^ "Earthquakes with 1,000 or More Deaths 1900-2014". Archived from the original on October 11, 2008. Retrieved April 13, 2016. ^ Talebian, M.; Jackson J. (2004). "A reappraisal of earthquake focal mechanisms and active shortening in the Zagros mountains of Iran". Geophysical Journal International. Royal Astronomical Society. 156 (3): 506–526. Bibcode:2004GeoJI.156..506T. doi:10.1111/j.1365-246X.2004.02092.x. ^ Razani, R.; Lee K.L. (1973). The Engineering Aspects of the Qir Earthquake of 10 April 1972 in Southern Iran. National Academy of Sciences. p. 144. Retrieved July 28, 2012. ^ National Geophysical Data Center. "Comments for the Significant Earthquake". Retrieved July 17, 2012. ^ "Utah's Earthquake Threat - U of U Seismograph Stations". Retrieved April 13, 2016. ^ NOAA. "NOAA page for this earthquake". ^ National Geophysical Data Center. "Comments for the Significant Earthquake". Retrieved August 25, 2012. ^ a b USGS (December 18, 2009). "Earthquake History for October 10th". Retrieved October 15, 2010. ^ NGDC. "Comments for the Irian Jaya Earthquake". Retrieved March 17, 2011. ^ Pascal Bernard. "Fault location and rupture kinematics of the magnitude 6.8, 1992 Erzincan earthquake, Turkey, from strong ground motion and regional records". Retrieved April 13, 2016. ^ NGDC. "Comments for the Significant Earthquake". Retrieved November 6, 2010. ^ "Significant Earthquakes of the World". Archived from the original on June 8, 2011. Retrieved April 13, 2016. ^ a b USGS (January 5, 2010). "Significant Earthquakes of the World 1996". Retrieved September 1, 2010. ^ "National Earthquake Information Center (NEIC)". Archived from the original on June 22, 2013. Retrieved April 13, 2016. ^ "NGDC page for earthquake". National Geophysical Data Center. Retrieved December 6, 2014.